These instructions show steps of scanning images using a flatbed scanner. Part of the Digital Stewardship Curriculum Module 2: Check It. 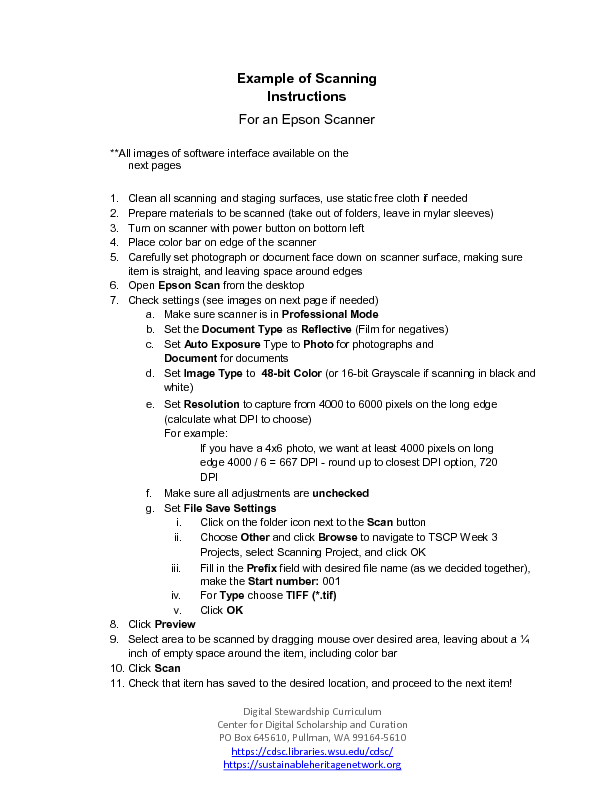 These instructions are an example of a document to show all the steps of scanning an image collection using a flatbed scanner. This information can be adapted when creating workflows for your institution. This document is part of Module 2: Check It of the Digital Stewardship Curriculum. This educational resource on the Sustainable Heritage Network website may be protected by copyright and/or related rights including a Creative Commons license. You are free to use individual items in any way that is permitted through the relevant legislation that applies in your country. At all times, you remain responsible for your own use. You may find additional information about the copyright status of each item in the Creative Commons, Publisher, and Source fields on each item.